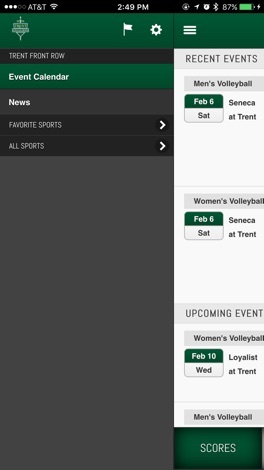 Fans can now personalize the app by setting up their "favorite" sports so they can quickly access those sports from multiple spots while navigating the app. We have also updated the design of the navigation which now gives fans quick filters of sports, news, and scores along with quick links to set up notifications and specific settings such as font size. 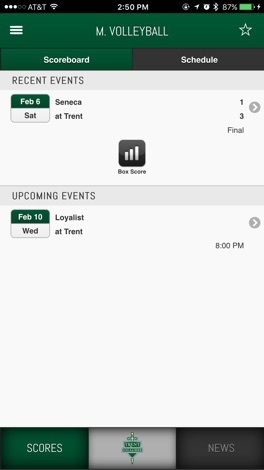 For anyone who is broadcasting events through PrestoSports those events will show up directly within the app now too for your fans to watch. With Trent Front Row, fans can cheer on the Excalibur teams as if they were in the front row. 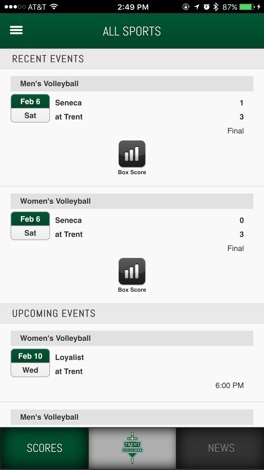 Created by PrestoSports in partnership with Trent University, Trent Athletics Front Row gives fans access to score updates, statistics and game recaps.